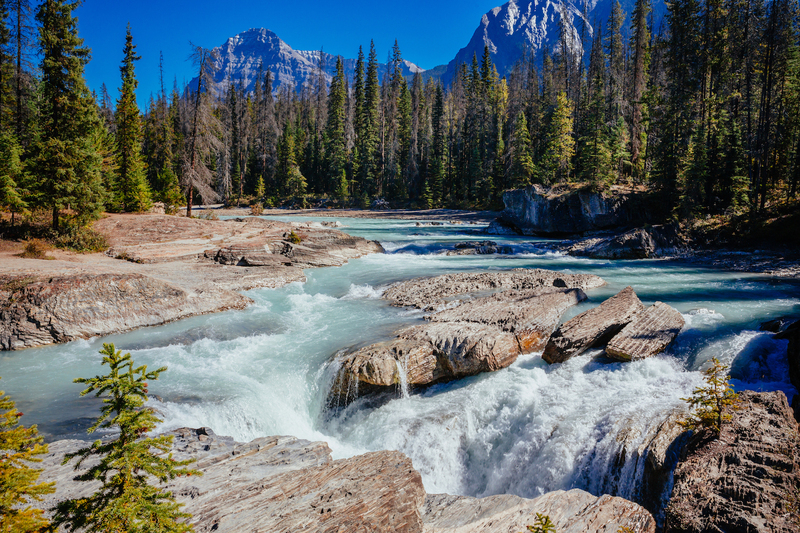 Yoho National Park is a UNESCO World Heritage Site for a very good reason. The Cree Native American tribe have an expression: “Yoho” meaning “awe and wonder,” and this park absolutely lives up to that moniker. The park connects British Columbia with the Alberta border and is home to the painfully charming village of Field. Less than 200 people call the mountain hamlet home. The businesses in town are open all year long, and it’s a wonderful place to visit any time of year. It was originally established in the 1880s for workers on the Canadian Pacific Railway, and today it’s the perfect home base for exploring Yoho National Park. Located directly between Kootenay National Park and Banff National Park, Yoho is not to be missed. Even though it’s the smallest of British Columbia’s national parks, it certainly packs a punch. The Trans-Canada Highway (AKA Highway 1) runs directly through the park, and is actually the only major transport route through it, as there is no public transportation you’ll need to arrive with a vehicle. Golden, British Columbia and Banff have rental car facilities. There are four campgrounds in the park, and plenty of hikes, ranging from easy to advanced. The park was actually established in 1886, after a visit by Prime Minister John MacDonald and his wife Agnes, who were travelling through the Rockies and taking in the sites of this untouched land. If you’re hungry the Siding Cafe and Truffle Pigs Bistro are two favourite eateries in the park. Like most Canadian parks, the weather can be quite precarious at times, so be sure to bring layered clothing. The coldest months are between November and April (with December through January being particularly bone-chilling). Be sure to get a park pass either online or at the visitor centre in Field. Also, if you plan on camping you’re going to want to reserve a site, keeping in mind that the busy season is from the middle of June through September. If you get to a campsite by noon you’re more likely to get a spot, as it’s first come, first serve. Don’t feed the wildlife and throw all your trash in the garbage bins (this not only keeps the park clean, but it helps prevent bears from wandering into your space). Remember to check for seasonal closures due to mud, rain, or snow. Kicking Horse Pass crosses the Continental Divide and holds historical significance for its usage as the Canadian Pacific Railway’s main line between Lake Louise and the village of Field. It’s also the railway’s highest point, and when trains pass through it, it looks as if they’re disappearing straight into the mountain. The pass has since become legendary. So, how did it get the name “Kicking Horse Pass”? Well, it’s pretty obvious if you think about it. Way back in 1858 there was an overland expedition to explore the Western Canadian frontier, led by Captain John Palliser, and attended by James Hector, a geologist and surgeon. During this expedition, Hector was kicked by a horse in his chest, and named the mountain “Kicking Horse Pass.” So, in case your wondering, that’s the story. The Burgess Shale Geoscience Foundation is dedicated to finding, studying, and preserving marine fossils that are over 500 million years old. The Burgess Shale is a very important site where some of the greatest geological discoveries have been made. It’s here where scientists study both fossilized hard body parts and soft tissues, which offer insights into evolution. The Foundation runs guided tours of the site every year, from June through September. You can hike up the Walcott Quarry and explore the Burgess Shale with a guided tour group, or head to Mount Stephen where you can explore trilobite beds. Wapta Falls is the largest waterfall located along the Kicking Horse River and is wider than it is tall, but it’s a breathtaking and powerful cascading wonder. There’s a very short and easy hike to the falls that takes you through a lush forest. Just off the Trans-Canada Highway, these falls are easily accessible from June through October but keep in mind the trail is pretty popular during the high season (July through August). One of the most recognizable lakes of Western Canada is Lake O’Hara. Surrounded by towering mountains, the lake is set into a valley and surrounded by cliffs, sub-alpine forests, and loads of hiking trails. In order to preserve as much of the lake’s untouched beauty the Park’s system has mandated a reservation system, so be sure to stop into a visitor centre or call ahead to arrange your reservation. Also, during the winter, particularly February and March, there are frequent avalanche warnings, due to the proximity of the lake to the surrounding mountains. While, it’s a popular place for skiing, it’s important to heed warnings and be well-trained and prepared if you venture out here during the winter months. It’s hard to describe the indescribable drama of Takakkaw Falls. It’s one of the tallest waterfalls in Canada, and has lured hikers since the park was first established. The falls are relatively easy to access between June and October, via car and bicycle. But, be prepared for some very tight, white-knuckle switchbacks on your ascent and descent. Like Lake O’Hara it’s important to stay up to date with avalanche warnings if you visit during winter. Yoho National Park is home to some adrenaline-pumping adventures, and none packs more of a punch than Alpine Rafting up Kicking Horse River. There are a few outfitters you can go with, but the Alpine Rafting company on Golden Donald Upper Road is the only British Columbia operated that’s allowed to run trips through an especially exciting stretch of the river. The park is home to some of the best whitewater rafting that the Canadian Rockies has to offer, and you can choose either a short trip or a full-day rafting odyssey, which includes a riverside BBQ lunch. When you’re ready to call it a day, Canyon Ridge Lodge is a family-owned and operated bed and breakfast located near the British Columbia Visitor Centre, close to downtown and Kicking Horse Mountain Resort. Another option for lodging in the area is the Cedar House Restaurant and Chalets, located on 10 acres of beautiful mountainside, just a few minutes from Golden’s downtown. These chalets have become quite renowned, and are frequently cited among the best weekend getaways in Canada. Each chalet comes with a fun kitchen, fireplace, BBQ, and even a hot tub. In addition, the onsite Cedar House Restaurant is considered the number one restaurant in Golden and has been listed as one of the top 50 places eat in all of Canada.